Gazing across the Convento River in southern Costa Rica, Taite Nazifi envisions a software solution for conservationists who examine the water rushing below. He snaps photos, observes wildlife and considers fields of data that might be useful to collect. The UA junior is spending the summer scoping out rivers near Longo Mai, a village created on the notions of agricultural self-sufficiency and environmental protection. But Nazifi is not a typical study-abroad student. Rather, he is creating a web application for the "Movimiento Ríos Vivos," or "Living Rivers Movement." "I'm really excited about staying in the village because I need to get a feel for the heart of the community to build this app," said Nazifi, who is double-majoring in computer science and French. "This is my first time developing something like this. It's kind of like my own child." As companies look to build dams near Longo Mai, conservationists document conditions at area rivers to encourage environmental transparency. Though organized, they lack a sophisticated system to collect and store their data. That's where Nazifi comes in. "My objective is to build an extremely robust and usable mobile web application for an area that doesn't necessarily have a great internet connection, and for people who don't use web applications or devices often," he said. The app will have two components: a system to streamline on-site data collection, and a feature to capture and post 360 images live to the web. 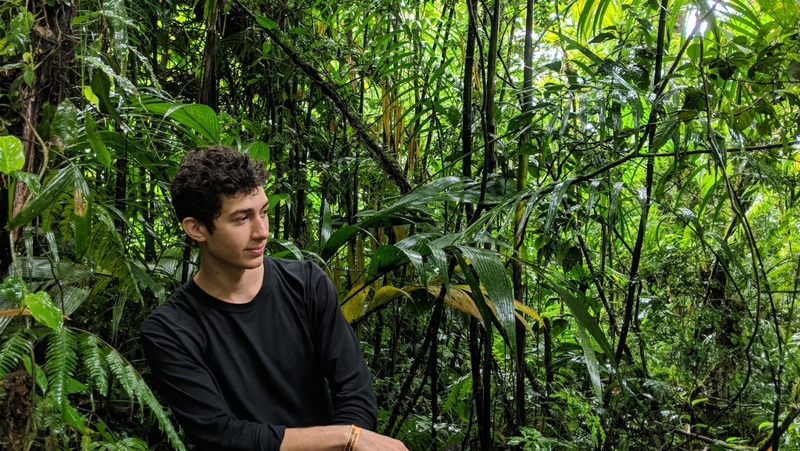 Nazifi was granted the opportunity to travel to Costa Rica as part of the Tech.Global program, which connects UA undergraduates with faculty members to develop cost-effective software solutions. Located in the UA Study Abroad office, Tech.Global emphasizes projects with an intercultural component and encourages students to embrace international opportunities. In this case, the Tech.Global team partnered with the Climate Justice study-abroad program to empower conservationists of Costa Rica, while also empowering a student developer from the UA. The project is called Justice 360. "Taite is learning firsthand how to design an application for people from a different culture in a foreign land," said Madeline Kiser, who co-directs Climate Justice with Oscar Beita, an assistant professor of family and community medicine at the UA. "We hope that Taite becomes proficient in creating software that is applicable to cultures other than his own." Nazifi is not only conducting research for the Justice 360 app, but also learning how the people of Longo Mai demonstrate resilience in the face of environmental challenges. The locals grow their own food, harvest water and strive to act with compassion, to one another and to the earth. Nazifi is staying with a host family in the village. "The first night was difficult because I didn't know any Spanish, but now I can successfully hold a conversation with my host family and understand the local environmental concerns, and I've only been here two weeks," he said. "The locals have taken a liking to me because of my efforts to speak their language, along with developing a similar love for their land and rivers." Nazifi will return in late June to the UA, where he plans to complete the Justice 360 app with support from his team. Ash Scheder Black, executive director of Tech.Global, believes the journey to Longo Mai will prepare Nazifi for a career in an increasingly connected world. "I believe we have entered a time where we don't have technological problems anymore, but cultural problems," Black said. "We can do amazing stuff with technology. It's the cultural challenge that will make or break us. I hope Taite comes back with his eyes open to the culture that he is building the app for." For now, Nazifi is enjoying the natural beauty of Costa Rica and the reflective lifestyle of Longo Mai. Each morning, he awakens at 5:30 to wash, meditate and pray at the rivers, a practice he describes as transformative. "I can't even begin to explain what kind of amazing impact this has made in my life," he said. "During the semester, I am so overwhelmed with work that it's difficult to find free time to sit and think, especially in nature. The mornings here by the rivers are my most cherished and valued experiences by far."